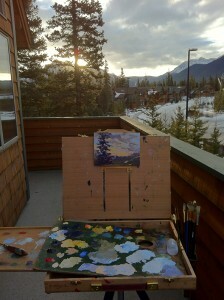 Plein Air Setup on my deck. To freshen up, and begin to feel as though I’m getting something done, I’ve taken to some quick alla prima plein air landscape work this past week. It’s a good feeling to hit the hay at night feeling like I’ve finished a piece! 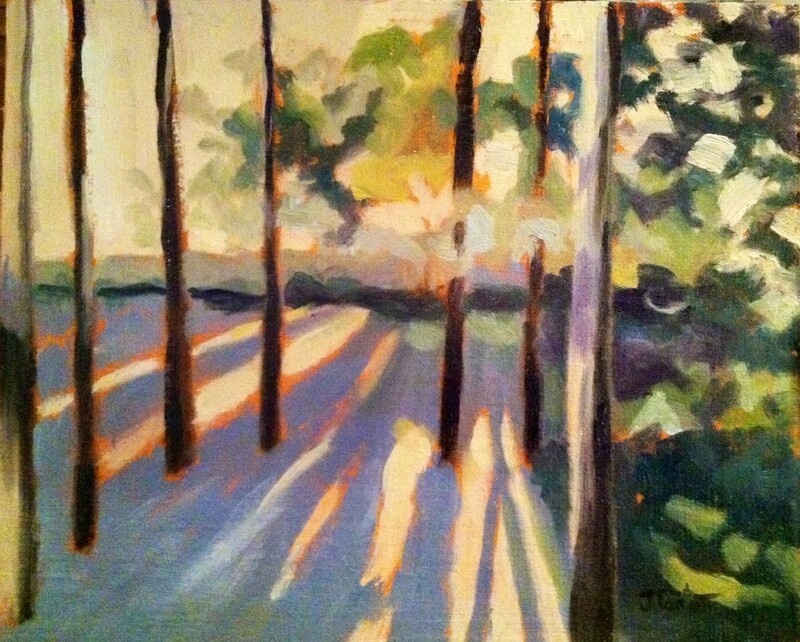 One of the reasons I love painting outside is that it forces you to see and to paint quickly. 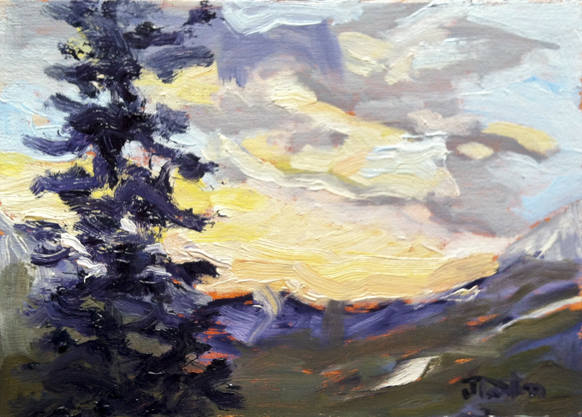 Choices must be made in a split second if you’re working on fast-moving clouds, mountain sunrises or prairie sunsets. Not only that…but the mountains in February are damned cold, by anyone’s measure. Your fingers and your paint freeze and thicken up, so you MUST work quickly. You must look only at colour and shape and the rest will follow. The plein air paint setup that I use isn’t yet what I’d call ideal, but I’m okay with it. I have an easel from EasyL which I find a bit wieldy for instant setup and capturing that quick moment. I’ve had it for quite a few years. This one that I have – The Versa… is too big for a quick “up and down”. I’m looking forward to the small pochade setup. I’ve got the tripod already, so have just ordered the small 8×10 box which should be easier to setup, pack in and out and move quickly. I have a couple of Jullian French Easels, which I find incredible if you are going to spend any time on one location with one painting. It packs a lot of equipment but is way to heavy to carry in and out of remote locations. Great for teaching outdoors, or in the studio though. "February Sunrise from My Upper Deck" ©2012 Janice Tanton. Oil on linen panel. 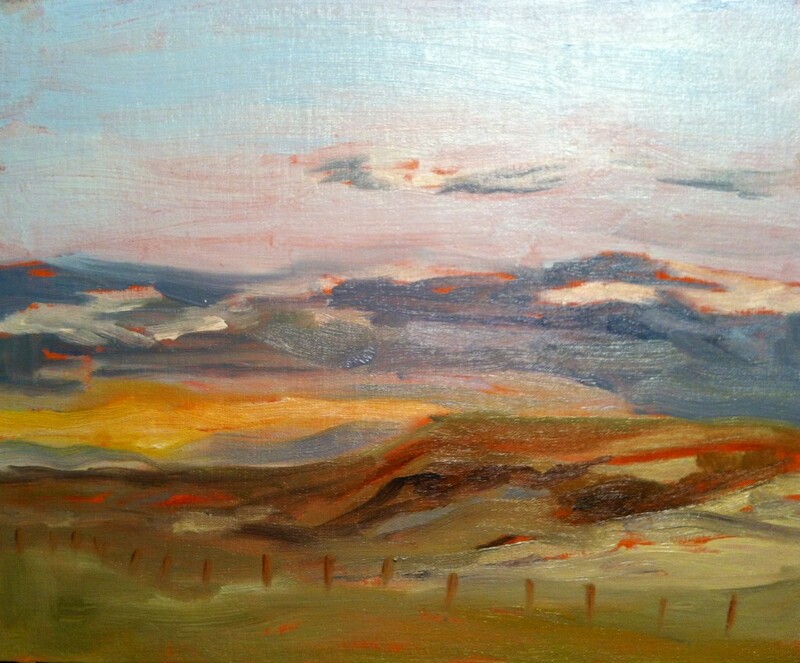 6"x8"
"Evening Sunset at Siksika" ©2012 Janice Tanton. Oil on linen panel. 8"x10"
"Grassi At Three" ©2012 Janice Tanton. Oil on linen panel. 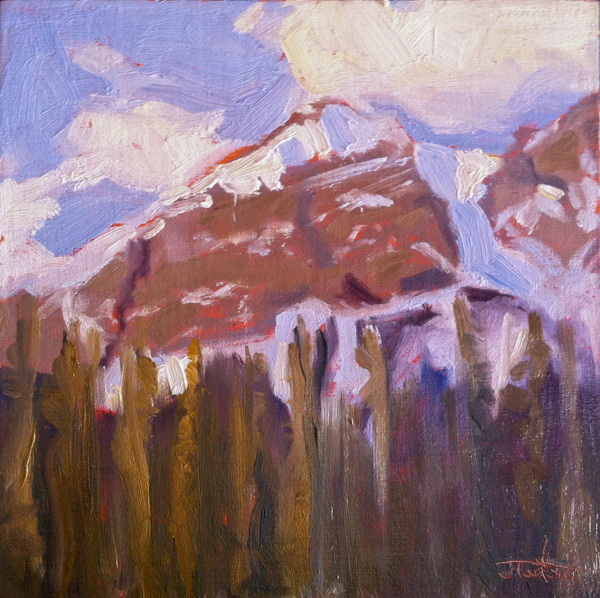 8"x8"
This last piece was done in the studio, from a photo and memory I had of an evening we spent camping on Agawa Beach in Ontario. Although it’s technically not a plein-air piece, the memory of the evening was so vivid and strong for me, that I feel it has translated well to this alla prima studio piece and I like the light in it. Having the chance to use some juicy, wet brushstrokes is wonderful! "Agawa Evening" ©2012 Janice Tanton. Oil on linen panel. 8"x10"
Love them all, but really love “Agawa Evening”. That’s the only way I can paint fast. Maybe I should try the reverse. Love you work no matter what you paint or how.